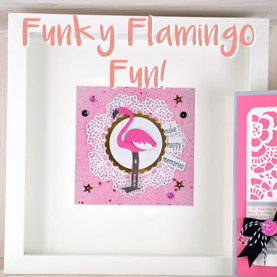 Spread your creative wings with these FREE Funky Flamingo project ideas! There is something for every maker with this fun die! From bunting, cards, a home décor frame and fashionable makeup bag, there are lots of projects to create for your family, friends and yourself. These are FREE for you to download today, simply enter your email address in the box! Днес искам да споделя с вас малко забавни и креативни идеи с фламинго.